When Joe Bush decided to build a 1972 GTX, he didn't let the fact that he didn't have one to build get in his way. He started this build with an original MPC 1971 Roadrunner annual kit. 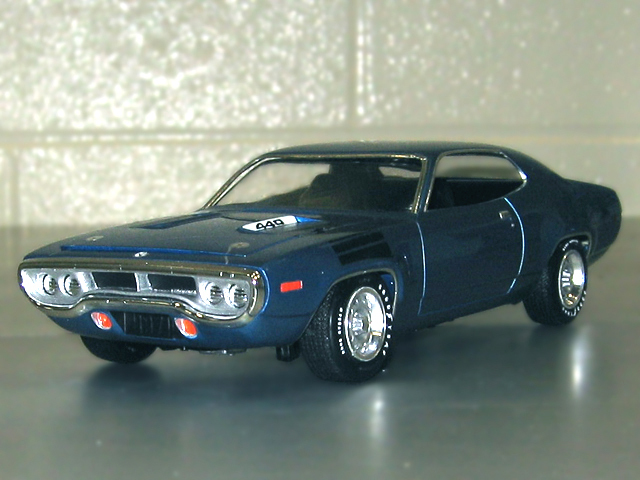 To this he added key elements from the Modelhaus, Fred Cady Decals, and his own partsbox to create his own 1972 GTX. In this shot you can see the prominent 1972 resin grille from the Modelhaus. You can also see the correct 1972 Duster wheels that Joe pulled from his partsbox. And of course you easily spy some of the Fred Cady decals that provide the finishing touch to this replica stock conversion.